Home/Blog/Explore Kerala, The Green Heaven on Earth! Are you thinking of taking a relaxed vacation to an enchanting destination? A trip to Kerala offers exactly what suits your needs.The southern state of Kerala is enriched with tropical beauty, breath-taking backwaters and exquisite temples. It’s called ‘God’s own country’ owing to its natural allure and traditional diversity. Travelbug India has compiled a list of best places in Kerala that should be added to your bucket list right now. We specialize in Kerala tours and travels and offer you the best of Kerala, where leisure and relaxation is consequential. The top attraction in Kerala is the magnificent backwaters, and the best place to enjoy a houseboat ride in the tranquil waters of Alleppey. Termed as the ‘Venice of the East’, Alleppey leaves the tourists stunned with its picturesque exquisiteness. The heartening houseboat ride will glide through palm lined canals, paddy fields and villages, making this an entrancing experience. Dig into some traditional Kerala cuisine and engage in fishing with the locals. Munnar is an extraordinary location on your Kerala tours and travels, adorned with the misty hills and variant plantations. This captivating hill station is ideal for honeymooners with luxurious resorts and relaxed home-stays. 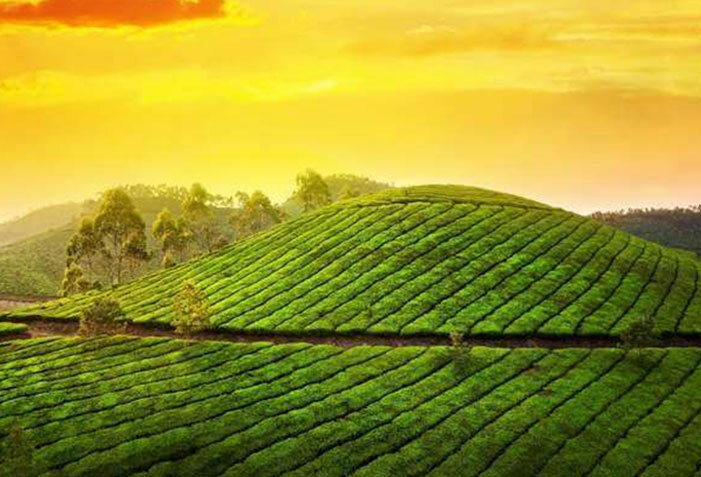 The high green valleys along with 80,000 miles of tea plantation enhances the radiance of this heavenly destination. Kerala tours and travels offers you a fulfilling vacation for all kinds of travellers. A must visit spot in Kerala for the wildlife enthusiasts is Thekkady which has the popular Periyar Wildlife Sanctuary. You can spot lion tailed macaques, sambars, boars, bisons and many other exotic animals. There’s more to your trip to Kerala, as you can enjoy a bath with elephants, spend half a day and click a selfie with these mighty creatures for everlasting memories. Adventure knows no bounds in Thekkady as you pass through the thick woods of forests observing the rich wildlife. We understand that you deserve a luxurious and leisure vacation and so Kerala tours and travels offers the most attractive destinations in Kerala. Wayanad is the perfect blend for a luxurious stay whilst you are closest to the nature. You must experience staying in a charming tree house resort which is surreal. Catch a dreamy sunrise, spend some time with yourself as water gushes through the stream and birds chirp in the back. The mesmerizing scenery coupled with luxurious décor in Wayanad will etch memories in your heart for a lifetime. Your Kerala tours and travels is incomplete without some tranquillity and sun-bathing by the beach. And which better place other than Kovalam which is rated amongst the best beaches in India. An evening by the light house at the crescent shaped beach will leave you very calm and serene. Indulge in some Ayurvedic treatment to wear off all the worries on your perfect vacation to Kerala. There are several other tourist attractions around Kovalam which you must not miss like the Rock Cut Caves, Hawah Beach, Samudra Beach, Halcyon Castle, etc. Attracting a large number of local and international tourists is the stimulating Vagamon. Consider this place on your Kerala tours and travels as it is nestled perfectly on the Western Ghats, surrounded by lush green forests and estates. Perfect time to visit Vagamon would be during winters when the enchanting valleys are filled with fog as you adore the attractive orchards and greenery. Indulge in paragliding over the high green hills which will provide you a spectacular view. Kochi is situated in the beautiful district of Ernakulam on the coast of Arabian Sea. Fort Cochin is a historic site which has impressions of the foreign heritage of the Dutch, Arabs, Portuguese and the British. The beautiful streets have houses from colonial times and have popular architectural elements. The Chinese fishing nets adorn the shore line at Fort Kochi. Visit the St. Francis Church, the oldest church in India built by the Europeans and Vasco House which is said to reportedly housed Vasco Da Gama. Cherai beach is a favourite among tourists who visit this beach to relax and swim in the backdrop of coconut groves. Kochi is a mesmerizing location and a major attraction in Kerala. This cultural and traditional town of Kerala is a hit amongst tourists for preserving its rich traditions and heritage. Varkala is a beautiful coastal town and the only place in southern Kerala where tourists can find cliffs adjacent to the Arabian Sea. The sedimentary geo-morphological cliff formation is a unique geological feature on the otherwise flat coast of Kerala. Government of India and Geological Survey of India (GSI) have declared it as a geo-heritage site. Apart from this, Varkala is essentially a temple town and there are many old temples with exquisite carvings and great significance. It houses 2,000-year-old Janardana Swami Temple,which is an important shrine in India. Other places of interest in Varkalaare Durga Temple, Sivagiri Mutt, Kappil Beach, Golden Island, etc. The island village of Kumarakom is situated on the Vembanad Lake. This picturesque destination houses the popular Kumarakom Bird Sanctuary which is spread across 14 acres of land. Exotic species of migratory birds are reported to flock to this attractive bird sanctuary. Activities like boating and fishing can be availed at this stunning destination which is adorned with heavenly backwaters. This sleepy village allows you to laze around in a houseboat as you admire the varied birds in this exquisite backdrop. On this trip to Kerala, leave all your worries behind as you drown in the charm of this gorgeous Southern state. Kerala is no doubt the most sought after vacation destination in India due to nature’s display of beauty along with the rich traditional living. So, let Kerala be on your dream vacation list and book your Kerala tours and travel package with Travelbug India. We offer comfortable and deluxe packages at attractive and affordable prices.